Defense contractor Northrop Grumman has proposed equipping its RQ-4 Global Hawk drone with a “Freedom 550 radio” in an effort to reconcile disparate communications and data platforms aboard the F-22 Raptor and F-35 Lightning II. Under the proposal, the Global Hawk would fly alongside the F-35 and F-22 during missions. Both aircraft are heralded for their ability to fly undetected by enemy radar systems, but each jet uses different datalink systems, preventing pilots from transmitting information to one another, according to Northrop Grumman. The RQ-4 is proposed to fill this communications gap in anticipation of problems that may arise. In battle simulations held in Nevada in February, the F-35 was indispensable during missions even after firing its entire payload. The joint strike fighter’s sensor fusion system, for instance, gathers data from various sensors onboard the aircraft to “create a single integrated picture of the battlefield,” according to Lockheed Martin. With this technology, the F-35 is supposed to act as a force multiplier for aircraft by serving as a scout, informing fighters where enemy targets are located. “Before, where we would have one advanced threat and we would put everything we had — F-16s, F-15s, F-18s, missiles — we would shoot everything we had at that one threat just to take it out,” Lt. Col. George Watkins said following the Red Flag exercises at Nellis Air Force Base in Nevada, according to Popular Mechanics. “Now we are seeing three or four of those threats at one time,” Watkins added, because during the exercise the F-22 and fourth-generation fighters asked the F-35 to stick around and identify enemy positions after the Lockheed Martin joint strike fighter had launched all its munitions. “The F-35 and the F-22 Raptor pair up to make a particularly deadly team, according to the pilots. The Raptor uses its advanced air maneuverability to shield the F-35 from airborne threats while the F-35 relays data to the F-22 to paint a clear picture of the battlefield. Once the duo of fifth-generation fighters take out an initial wave of ground and air targets, F-18s, F-16s, and F-15s bring up the rear to provide support, all receiving target data from the F-35s in the field,” Popular Mechanics reported. Indeed, a Northrop official told Defense News in an interview that the Pentagon hasn’t sent out a request for bids. Northrop came up with a solution to what the firm identified to be a problem, but they are waiting for the government to announce a new capability “requirement” so that Northrop can get the contract. 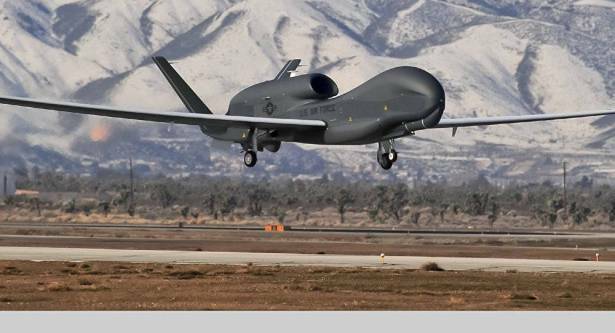 “We’ve got a solution that we’ve identified and made a pitch to the Air Force,” Mike Lyons, head of Global Hawk business development, told Defense News. “We’re just waiting for the requirements to basically say: ‘Go do [that],’” Lyons said, speaking from Palmdale, California. Lyons told Defense News he anticipates USAF to broadcast “a joint urgent-operational-needs statement” within six months.